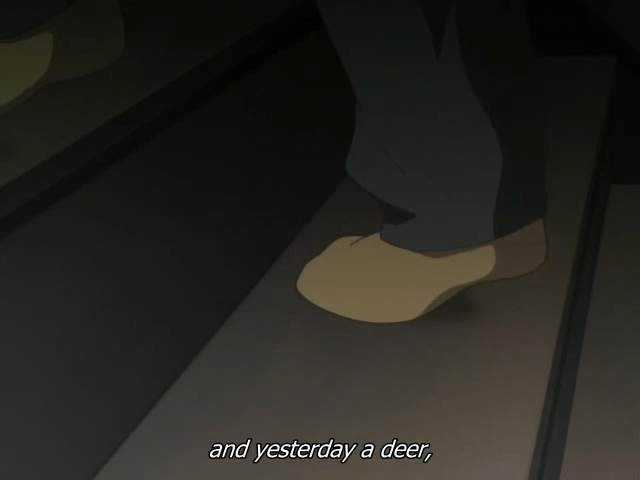 Thanks to Kurogane, I discovered that one of the puzzling lines Kotomi utters (“the day before yesterday, I saw a rabbit, and yesterday a deer, and today, you.”) in the past couple of episodes of Clannad actually comes from a short story by Robert F. Young called “The Dandelion Girl.” (Full text of the story here.) It was a science-fiction short story written in 1961, and published in the Saturday Evening Post. The author apparently wrote for both that publication and also for America’s premiere “soft” science fiction and fantasy magazine, The Magazine of Fantasy and Science Fiction (F&SF). I remember longing to have one of my own short stories published in that prestigious journal. I’m impressed some writer at Key knows his literary SF. I encourage you to read that story. It’s not only well-written, it is also quite moving. In fact, it’s like a Key story in many ways, involving time travel, unrecognized love, and a despondent man who discovers something about life that he’s forgotten. 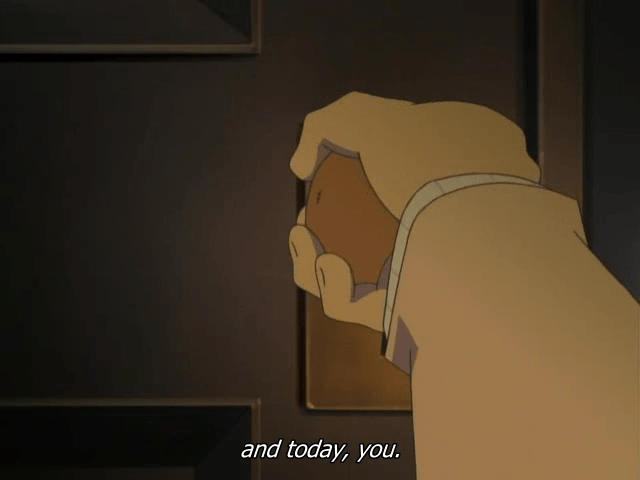 The Japanese, according to the Hayakawa SF poll, seem to have a particular affection for this story, so I suppose it’s no surprise that tales of this kind show up in Key productions and even in RahXephon. Since we’re now talking about literary science fiction, you know what I’d love to see? 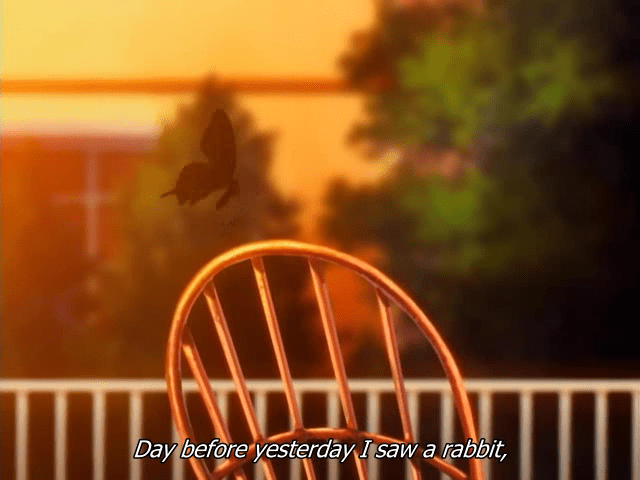 An anime adaptation of Flowers for Algernon. They could make Algernon really cute, shoot all of Charlie’s scenes from subjective shot angles like in ef, and make the love story contained in it real tragic. SHAFT should do it. Damn right. Previous PostKimi ga Nozomu Eien, Next Season 1–Is This the Same Takayuki We Know and Hate?Next PostThe power of the darkside fully spreading to Eastern Europe…Please teach them them the power of moe! Betterman had an algernon reference, but that really was in name only and it definitely isn’t a cute series. I was wondering where that phrase came from…many thanks to you and Kurogane for the info. The way everything clicks together at the end was interesting. You made my day. I did a look googling for Algernon, and there seems to be a J-drama for it in 2002? Dunno how that turned out. Also realised that there was the original short story, and the novel – only read the short story, not sure what I missed in the novel. @korosora: Damn right I am! They seem to have a knack for the kinds of shows that I like these days. @Demian: heh. It’s a well known enough story that I’m sure references appear everywhere. I was assigned the book in school, after all. @bakavic: you’re welcome. :) Indeed, it appears there has been more than one Japanese live-action adaptation of the story, along with more than one American movie too. I’d say the novel has a much richer development of the relationship between Charlie and his teacher/lover. @omo: But Charlie is a MAN. :) A man can’t be moe (in the same way)! Unless they are going to go for the Renge definition of moe. In which case I will join you in saying ‘no thank you!’ It has to be done seriously or it can’t be done at all. Have you guys seen the live action film for Flowers for Algernon? Let’s just say that pretty much put an end to any of my inclination to see that classic short story turn into anime.